The regal profile of a perfect pair of dance heels. The Riviera is so new that it’s not even on the Saint Savoy website yet, but will be in late November, just in time for the gifting season. They are taking orders, though, so contact them about placing your order. 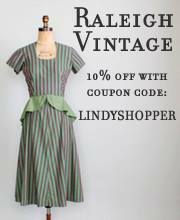 The green Rivieras are almost sold out already (I’m looking at you, Castle Camp)! Also available in light blue, brown, and a sassy tan/red color combo. Side view – can my entire life be this technicolor? It’s always good to have goals. Casual view, aka recovering asthmatic view. 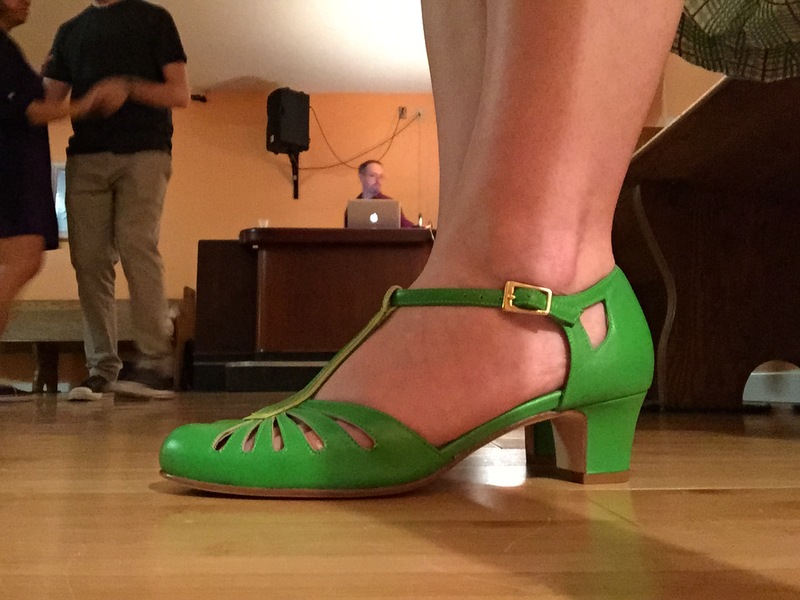 In October I wrote about Saint Savoy, a dance shoe company that had just come across my radar. 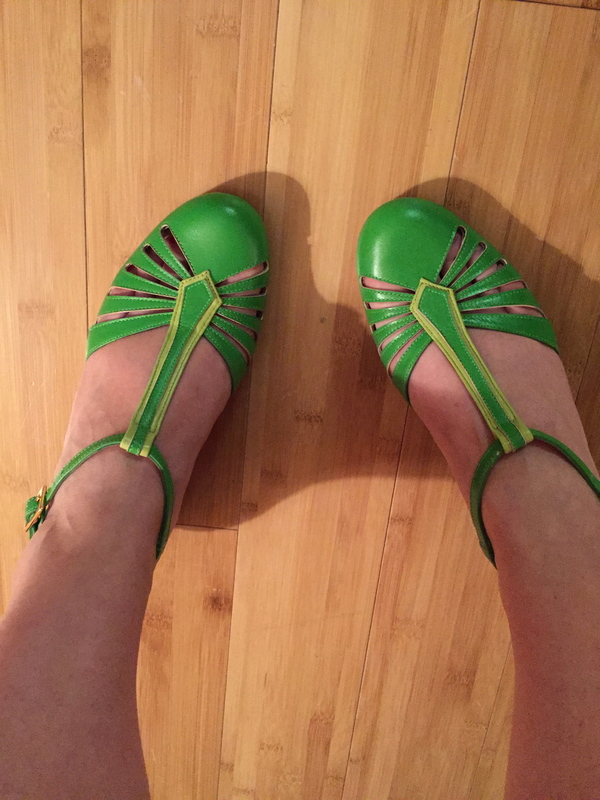 The owner, Rani Patricia, was kind enough to send me a pair of Saint Savoy’s Jitterdoll shoes to give them a test run and tell you about it here! The Jitterdoll is a low-heeled oxford shoe – not quite a full oxford in terms of top of foot coverage, but definitely more coverage than a pump. The heel height is 3.5 cm/1.37 inches and the heel itself is of a substantial width, giving the shoe a balanced feel and appearance, which I find tends to be lacking in some shoes with lower heels. The Jitterdoll laces up, which could lend itself to some fun options with laces. The shoe features both brogueing and contrast trim, giving it a unique appearance, but the overall effect is subtle. The best part of this shoe is the foot bed around the ball of the foot – there was ample room to acommodate my swath of toes, bone spurs, and bunions, with a soft interior, and a ridge at the base of the toes/top of the ball where everything just fit into the groove and felt supported. 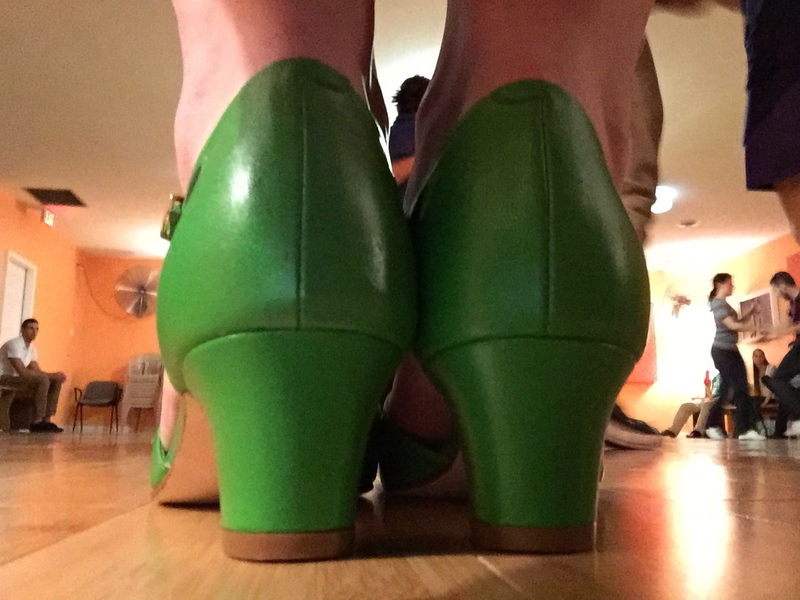 The leather sole at the ball of the foot was ample enough to take the pounding of a night of Lindy and Balboa, without sacrificing the feel of the floor. 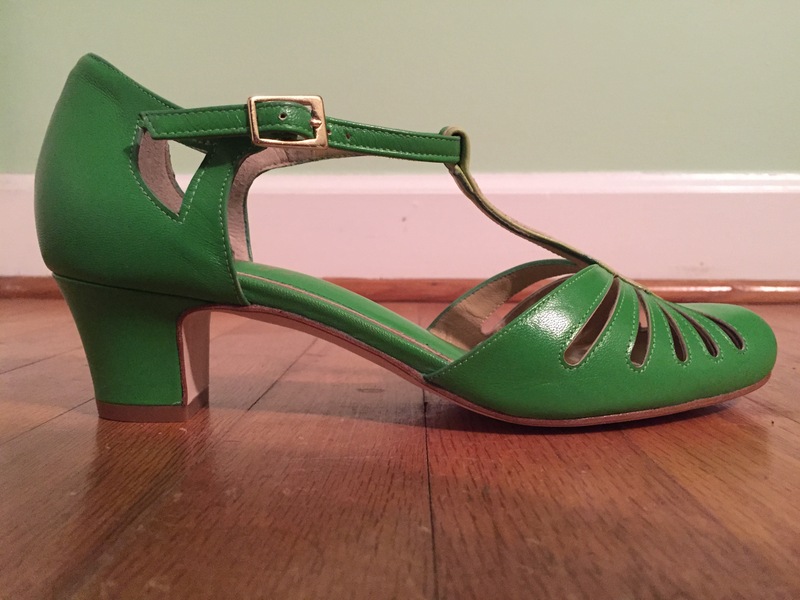 The heel height is just perfect to go back and forth between Balboa and Lindy Hop and I would recommend this shoe for people who are looking transition from flats to heels without making a giant leap. Aesthetically, the shoes are very pleasing – I got a ton of compliments on the appearance of the shoes (I opted for the tan shoes with white brogueing and red piping, though that green pair is calling my name) and I think the idea of more subdued and detailed oxford is a brilliant idea. I also like that they are closed toe shoes – so many of my heels have an open toe and it’s nice to have the option of tights or hosiery in the winter without worrying about my toe pushing through my hose to freedom through the peep hole in my shoe, and also to avoid the hosiery toe seam poking out. We’re not always in the mood for fishnets, right? OK, maybe we are, but variety is the spice of life and these shoes are great, bare-footed, with fishnets, or with close-toed legwear. The only downside of the shoes for me was that my heel slipped out of the back, but I must explain that almost all of my dance shoes do this because I have a narrow heel. I noticed it the first night I took them dancing, so for the second dance night I added the Pedag heel grips and they stayed right where they needed to stay. 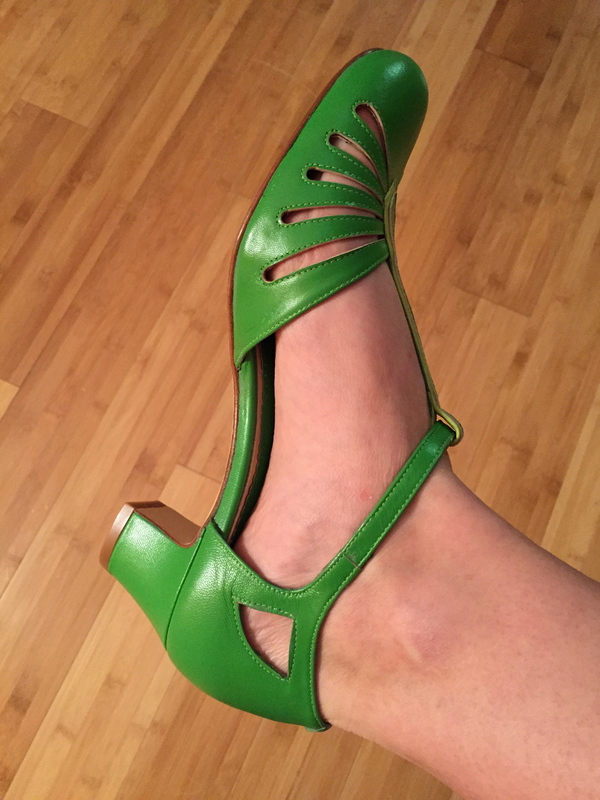 The Jitterdoll is a wonderful addition to our dance shoe options and I also think that they would make stellar street shoes, based on their comfort, style, and leather sole. Saint Savoy is offering free shipping worldwide, so if you’d like a pair of these under your tree (or as a treat to yourself), you’ll save a bit there. 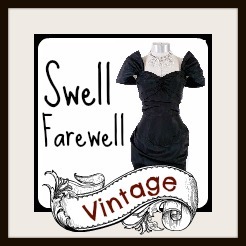 The Jitterdoll is available in black, early green, and the sand colored pair I received, which will be available soon. Quality construction, comfort, and a great low-heeled shoe for your dance shoe wardrobe! News flash! Emily, the adorable brogued t-strap heel launched by Re-mix Vintage Shoes earlier this year, has expanded color offerings, adding brown and black as more practical/seasonal options to the lovely cream and ultramar blue. In light of the possible phasing out of the Balboa shoe, these are welcome t-strap additions to the Remix line! I can’t seem to pull the photographs on my email and they aren’t up on the website yet…but I promise there’s a pair in black.